What cooler way to celebrate the opening of TriMet’s MAX Orange Line and Tilikum Crossing, Bridge of the People, than with a new Salt & Straw ice cream flavor! But that’s not all. 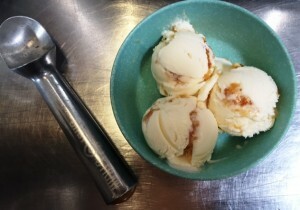 Beginning Friday, Sept. 4th and throughout the month, Salt & Straw is donating a portion of the proceeds from the special-edition Olive Oil and Burnt Orange Marmalade ice cream to Ride Connection. The non-profit organization provides transportation options for people over 60 and people with disabilities in Clackamas, Multnomah and Washington counties. Salt & Straw’s head ice cream maker, Tyler Malek, created the Olive Oil and Burnt Orange Marmalade ice cream to honor the Orange Line and the “epic-ness” and “beauty” of Tilikum Crossing. Salt & Straw describes the flavor this way: Our olive oil ice cream is stark and clean like the white lines of the Tilikum Crossing’s cables. Meanwhile, a splash of burnt orange marmalade glides through this ice cream like our hometown MAX trains. TriMet partners with Ride Connection to helps seniors and those with disabilities learn how to ride our buses and trains to increase their mobility and connect with services, jobs and other opportunities in the community. TriMet and Ride Connection also are teaming up to introduce older adults living in facilities along the new MAX Orange Line to the MAX service as well as educate them about the bus improvements being made in the corridor. “We are thrilled to partner with TriMet on the historical opening of the MAX Orange Line and we are honored that Salt & Straw has selected Ride Connection to be the beneficiary of such a sweet and exciting fundraiser,” says Lydia Corran, Ride Connection’s manager of development and outreach. The Olive Oil and Burnt Orange Marmalade ice cream first made its debut at TriMet’s Orange Picnic & Fireworks Spectacular on August 22 to rave reviews. It will be available in Salt & Straw stores starting Friday, Sept. 4. You also can get a scoop of the Orange Line-inspired ice cream on the MAX Orange Line opening day. It will be available at street fair being held next to the Clinton St/SE 12th Ave Station beginning at 11 a.m. For information on the fair and the many ways TriMet and the community are celebrating the opening of Tilikum Crossing and the MAX Orange Line, go to catchtheorange.com. 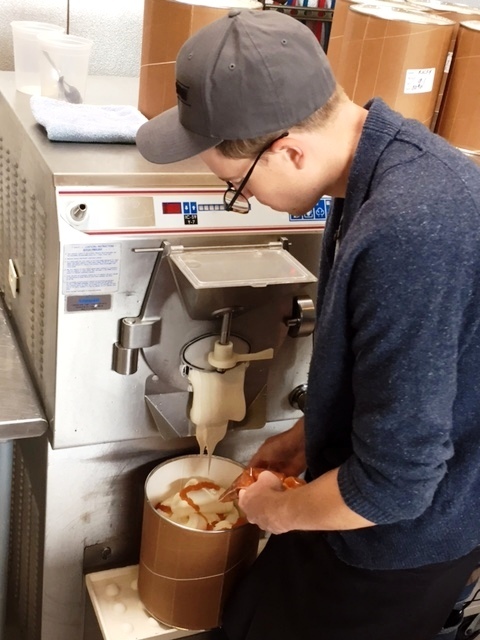 Check out a video of Salt & Straw head ice cream maker Tyler Malek mixes up a batch of MAX Orange Line-inspired ice cream. Ride Connection is a non-profit organization based in Portland, Oregon that provides transportation options for people over 60 and people with disabilities in Clackamas, Multnomah and Washington counties. Access to transportation is more than a just a ride; by giving our neighbors the means to get around we offer independence, health, and inclusion. Ride Connection partners with a number of local agencies to coordinate these crucial services in our region. Together, we provided nearly 500,000 rides last year and supported over 2,000 individuals with public transit training. Salt & Straw Ice Cream is a chef-driven ice cream kitchen with scoop shops in Portland and Los Angeles that partners with local artisans, producers and farmers to serve unusually creative and absolutely delicious ice cream. Each ice cream is handmade in small batches using only all natural cream from local farms in each city. Flavors showcase the best local, organic and sustainable ingredients from Oregon and Southern California farmers and artisans as well as imported flavors from small hand-picked farms from around the world. The company started in Portland, OR serving eight flavors from an ice cream cart in May of 2011 and now has three scoop shops in Portland and one in LA. Scoops of hand-made, small batch ice creams, sundaes, milkshakes and floats as well as pints to go are available at each with an ice cream sommelier of sorts who will gladly take you through a tasting of all the flavors. Favorites, seasonal, design your own variety packs and pint club memberships are available for online purchase and can be shipped anywhere in the United States. Salt & Straw’s ice cream cart is available for catering parties and events. Find more information at www.saltandstraw.com or call 971-271-8168. Follow us on Facebook at Salt and Straw Ice Cream, Twitter and Instagram @SaltandStraw. The 7.3-mile MAX Orange Line opens on Saturday, Sept. 12, 2015. It will improve transit along the corridor that extends from the terminus of the MAX Green and Yellow lines at Portland State University in Downtown Portland to South Waterfront, SE Portland, Milwaukie and North Clackamas County. Tilikum Crossing – the only one! The Orange Line’s Tilikum Crossing is the only bridge of its kind in the U.S. carrying MAX light rail and Portland Streetcar trains, buses, bicyclists, pedestrians, but no private vehicles. Milwaukie, Multnomah County, City of Oregon City, Oregon Department of Transportation, City of Portland, Portland Development Commission and TriMet.